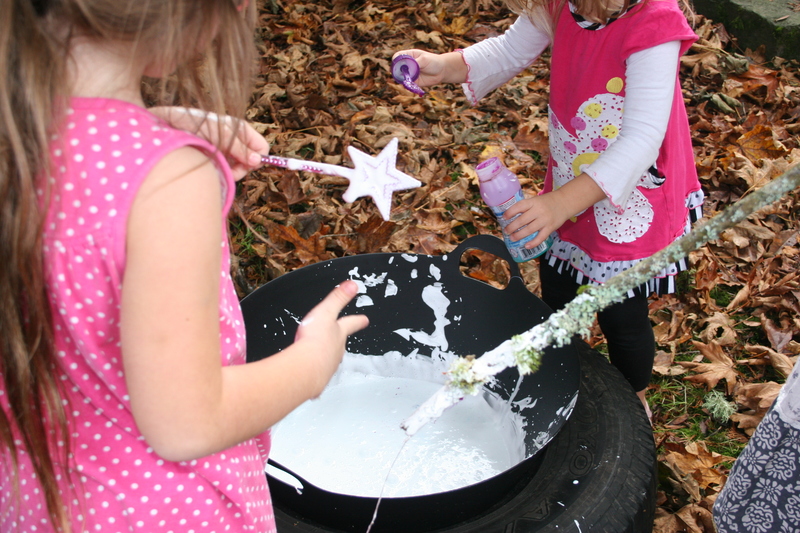 One of my favourite Hallowe’en activities as a teacher was creating spells and dancing around the cauldron. The children were transfixed by the iron cauldron that emerged from the kitchen and wondered if it might belong to a real witch. Dressed in witches hats and cloaks, we would imagine fantastical ingredients and create spells that would transform us into dragons, frogs or birds, that would make us fly, shrink or become invisible. 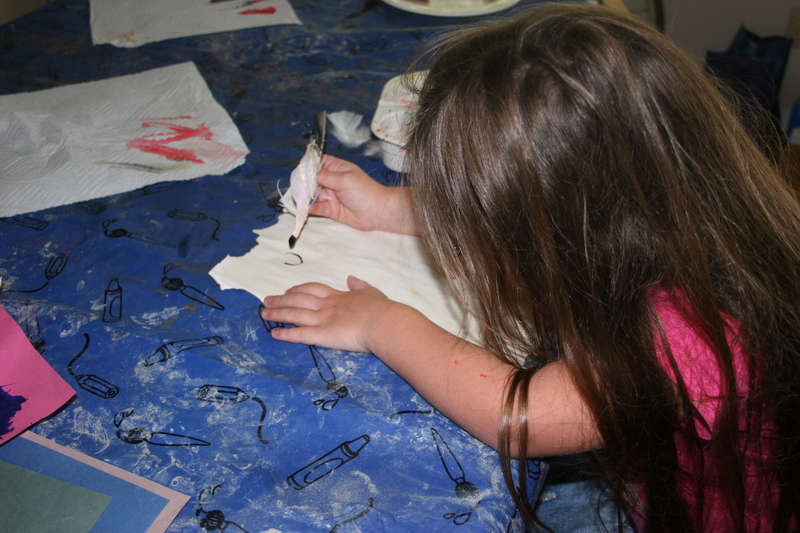 It was a fun way to explore rhyme, share ideas and use our imaginations. 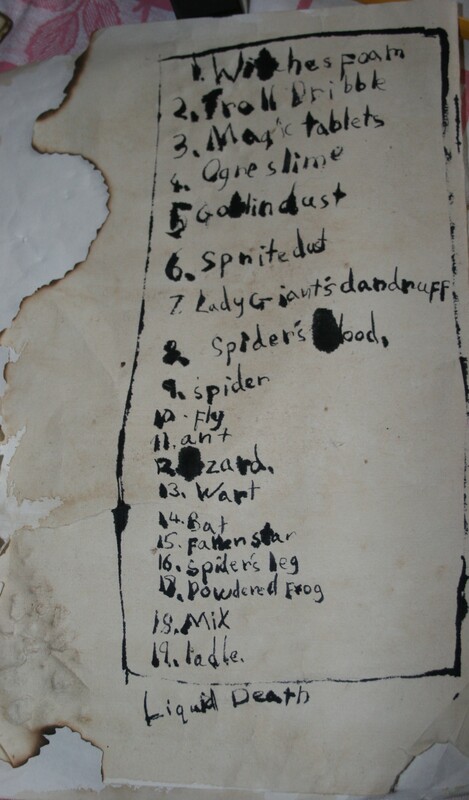 We left ‘spell books’ in the mark making area and the home corner became a witches cave complete with potion bottles, spell books and jars of bugs, bats and frogs. My girls love to make potions, so when I told them about it, they loved the idea but wanted to make a real witches brew. With wands in hand, they chose ingredients to go into the brew. They didn’t think witches and wizards used shaving foam or cornflour to make a spell, so they chose gruesome alternatives. Flour became giant’s dandruff, hair gel was ogre snot and fuzzy balls became warts. The girls wrote down their ingredients so they could remember the order in which to add them . 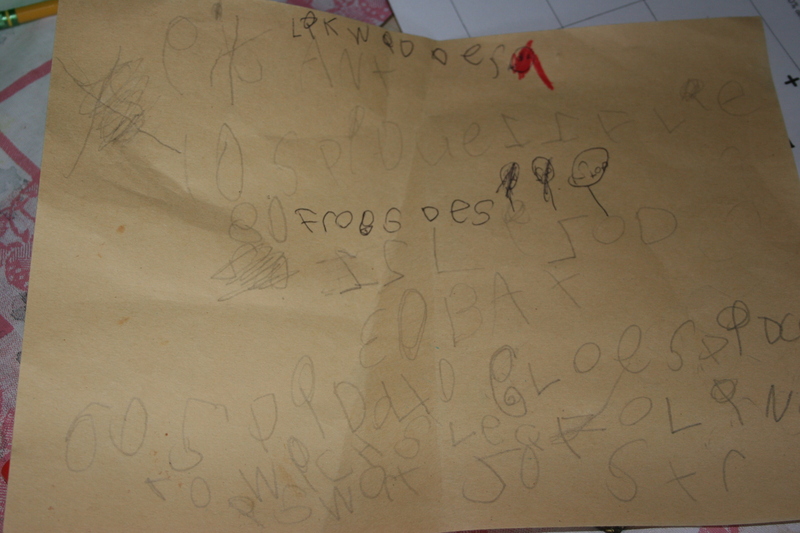 It didn’t matter that my youngest is only just beginning to write, she found her own way. 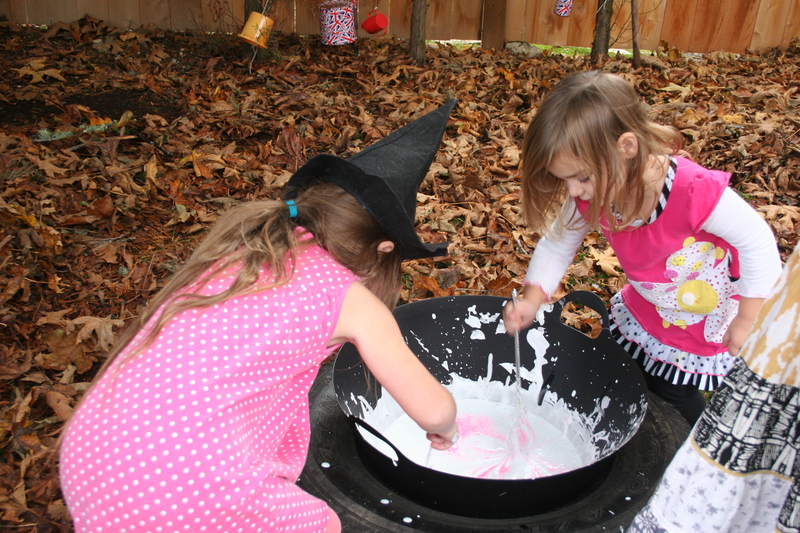 Armed with spells, wands and witches hats, they made their way outside to the cauldron at our potion station. One by one, they tossed the ingredients into the cauldron, stirring it and modifying the quantities until they were satisfied. Then it was time for the spell. We looked for the dragon but decided it was hiding amongst the clouds. The dance around the cauldron resumed with another spell. Thanks girls, I’m not sure I want to hang upside down from a tree. The potion remained in the cauldron for sometime and became the central point of their witch and wizarding school. Give the children collection bags and a card with ingredients for a spell, in picture and written format. Ask the children to find the objects they need and place them in the bag. Give the children a group of objects and ask them one at a time to add a specific number into the brew. 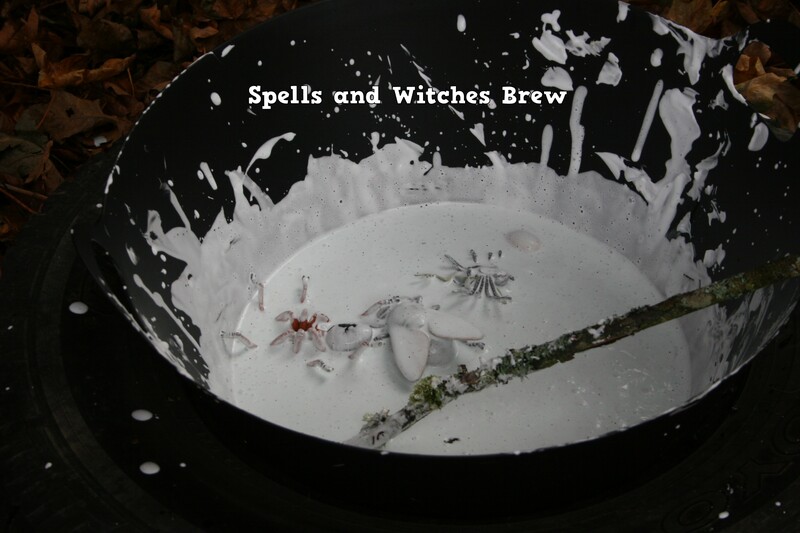 Chant around the caldron and make spells that require the children to make specific movements e.g make us slither like a snake, make us jump or stretch up tall. British Children Learning to Read and Write in the US. I knew my youngest children would learn to read and write in the US and as a result I would have to accept that they would spell differently and use American phrases and grammar. There are some unexpected differences however that I hadn’t considered. 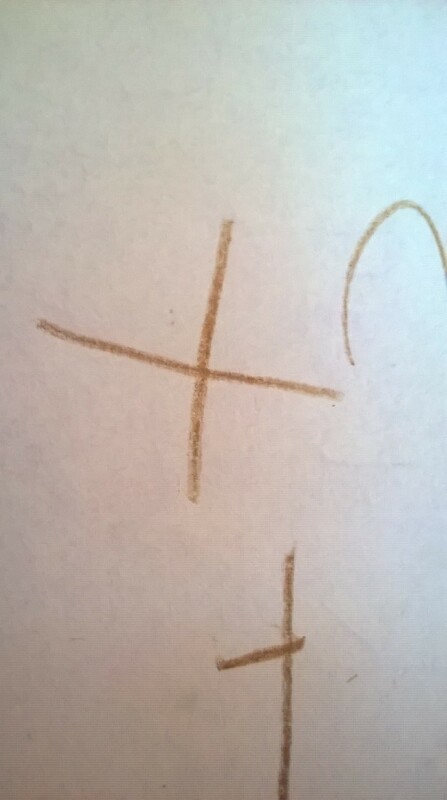 My youngest is 4, I taught her to write her name but it never crossed my mind that letter formation might be different here. I checked with the teacher and she explained that they use the ball and stick method where letters such as t, w and y use straight lines rather than curves as they feel it is easier for the young children to master. It is one of many differences that I hadn’t anticipated. I always believed the transition would be most difficult for my eldest, who went to school in England until she was 8, so learned to read, spell and write ‘the English way’. The first thing she noticed, was that punctuation had different names; full stops were periods and brackets became parentheses. We were really keen that she wouldn’t lose her knowledge of British spelling, so school agreed that she could learn both. As an avid reader and proficient speller this wasn’t really difficult. Choosing books wasn’t simple either. Most books by British authors are rewritten for an American audience. When we borrow books by British authors from the library or buy books here, they are American versions. My daughter is really eager to maintain her ‘Britishness’, so we often order books from the UK. This way she can still read books with British spelling and vocabulary and is able to read literature from both cultures. Tonight we read an American translation of Pippi Longstocking. This was my daughter’s favourite book for many years, so she knew much of the text by heart. Every time she spotted a difference, she would quote the British text. In the end we got her old battered copy down to compare. I was surprised that though the meaning remained the same, the texts were very different. The monkeys name was different and the language in the British version was more detailed and poetic (although I am sure that the original Swedish is even more rich). My daughter’s desire to maintain her British identity isn’t without its pitfalls. Once she was marked down in a piece of writing because she referred to a ladybird rather than a ladybug (which I felt was a little harsh). 1. The alphabet ends with zee (my daughter has decided that it makes more sense the American way because the song rhymes). 2. What sound does a short ‘o’ make? To us it is o as in fox, box and top but American pronunciation is different, instead it makes the sound a as in fax, bax or tap. Confusing but also a little amusing to the girls who still have perfect English accents. I think I was fortunate that my daughter was beginning to read when she went to school and had already learned basic phonics so this wasn’t too much of an issue. The omission of “ly’ at the end of adverbs is common as in ‘We need to be real quick’. I suppose one positive is that the girls generally notice and remark that it sounds different. When my daughter reads a word that we don’t use, she substitutes it for the British word “I’m just going to say mum not mom”. 4. Sometimes they complete worksheets where they have to circle pictures that begin with particular letters. This can be confusing if the British word is different from the American or if it is something traditionally American like baseball equipment. On the whole I think the girls awareness of the differences gives them a far richer experience of the written word. It certainly gives us a lot to talk about. The lead up to Christmas was a great time for writing messages in our house. Our visiting elf Christopher Poppinkins left notes for the girls and they responded with their own notes, we made gifts for the neighbours with a little note attached, wrote Christmas cards for the family, shopping lists and yesterday the girls helped me write a list of songs for my music class. As children approach school age, parents are often anxious about their children’s emerging literacy and how best to support them at home. When is the right time to introduce writing? 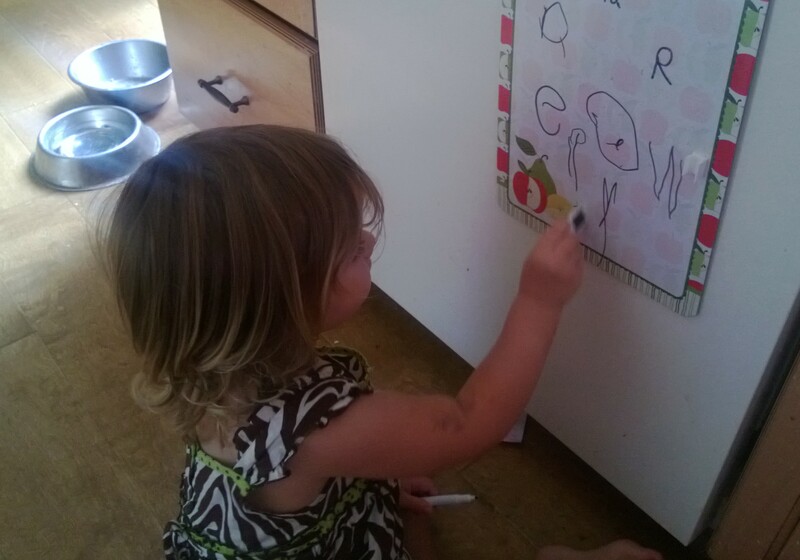 Does my child need to be able to write their name before they go to school? Do they have to form letters in a particular way? Writing is a complex skill involving much more than the correct formation of letters. I can’t guarantee that my girls will continue to love writing but I think we are headed in the right direction. On the way home from school we were talking about quills. My Harry Potter obsessed 9-year- old had made a quill by putting a biro refill into a feather. Do we have any ink? No but we can use paint. 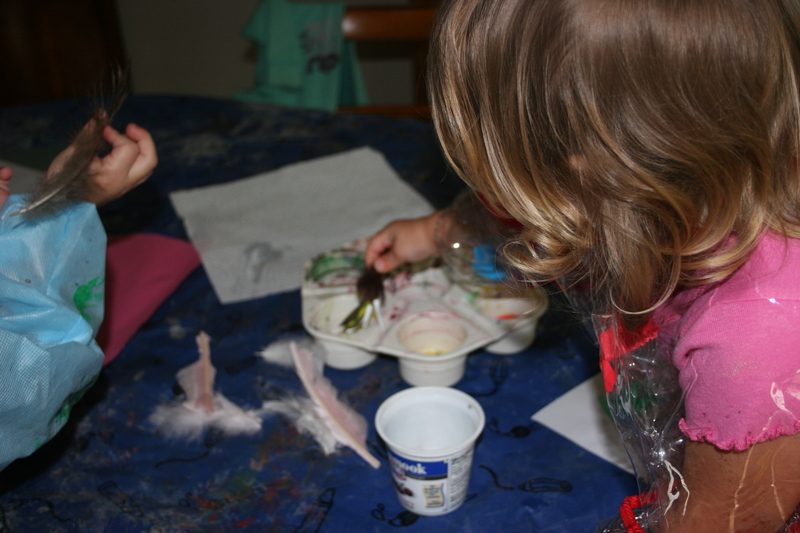 We painted with feathers when I was little didn’t we? We can do that tomorrow if you like. We could use the Peacock feathers we collected at Remlinger Farm. I set the paints up with a few feathers. She has been playing a Sesame Street alphabet game on the iPad and is beginning to talk about letters and letter sounds. How do you spell bat? How do you think you spell it? What does it begin with? That’s right and what other sounds are in bat? Yes, so what is the middle letter? Bat…b…a…t….. a. B..a..t spells bat. After a little bit of impromptu literacy I had a brain wave. 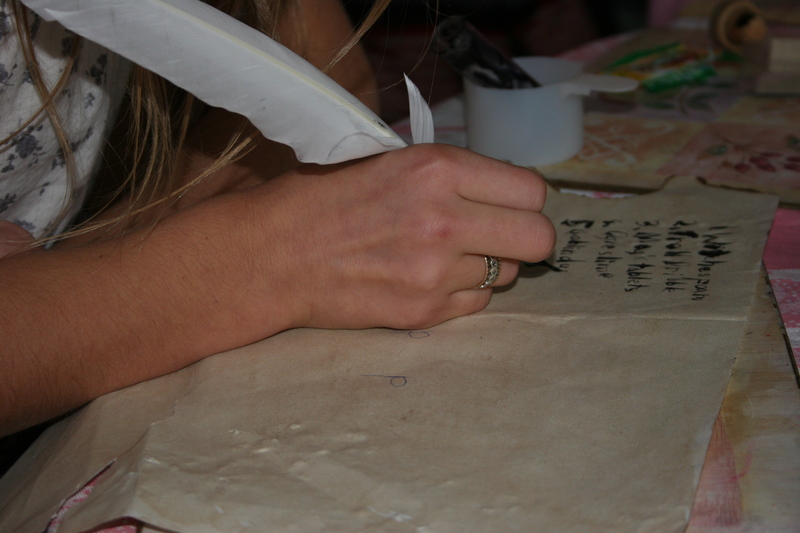 The girls are really interested in pirates at the moment and I thought we might be able to do some writing with feathers, make a pirate map or maybe we could make a wizard’s spell. 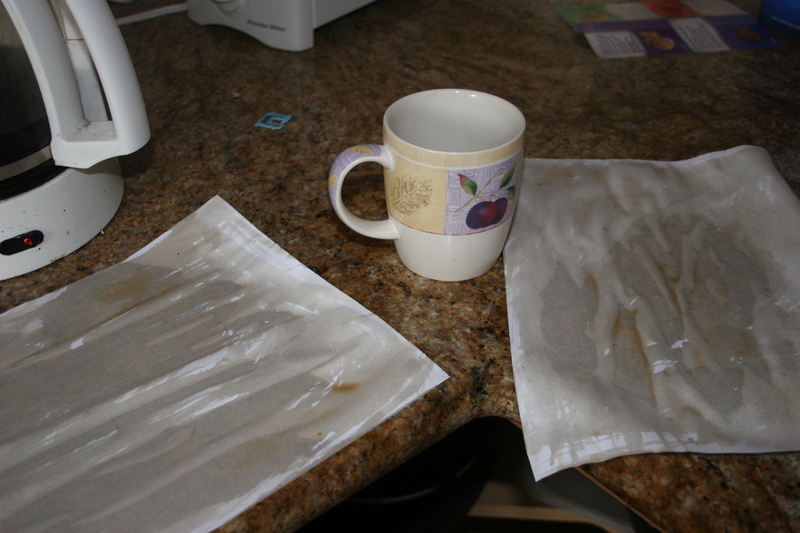 When it was dry I singed the edges to make it look like an old scroll. I asked the girls what they would like to do. They decided on a Wizard’s spell. It will be funny because we don’t even know how to read and write……………. Maybe Wizards write differently to people. I think this would be a great way to encourage boys in their mark making. 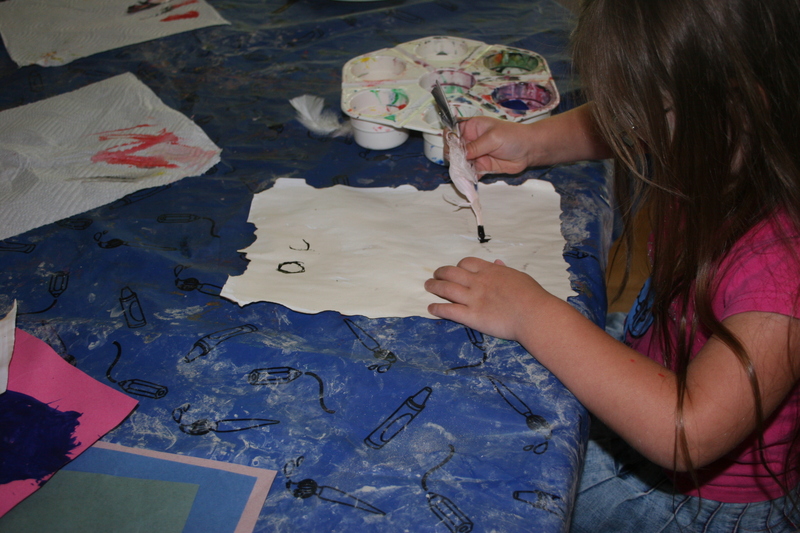 Make treasure maps and encourage the children to mark the treasure with an X.
Literacy for under 5’s shouldn’t be about sitting at a table learning letters, tracing over letters or using flashcards. It can be brought into any aspect of play and when children are ready and interested in letters and sounds they will talk about it, ask questions and experiment. Make it fun, make it relevant and they will learn. *mum goes to fetch a tray. Can we have some toys in it? Yes of course, go and see what you can find. I’m making footprints, Spike makes 4 footprints. Now I’m rubbing it out. Getting my children to put things away when they are finished is often a struggle but sometimes it has its advantages. A tub and paintbrush were left on the driveway. After a few rainy days it inevitably filled with water. My 2-year-old picked up the brush, dipped it in the tub and proceeded to paint the garage. On a sunny day she returned to the tub but couldn’t find her paintbrush. I brought a selection from the garage and as she discovered the different lines the brushes made. 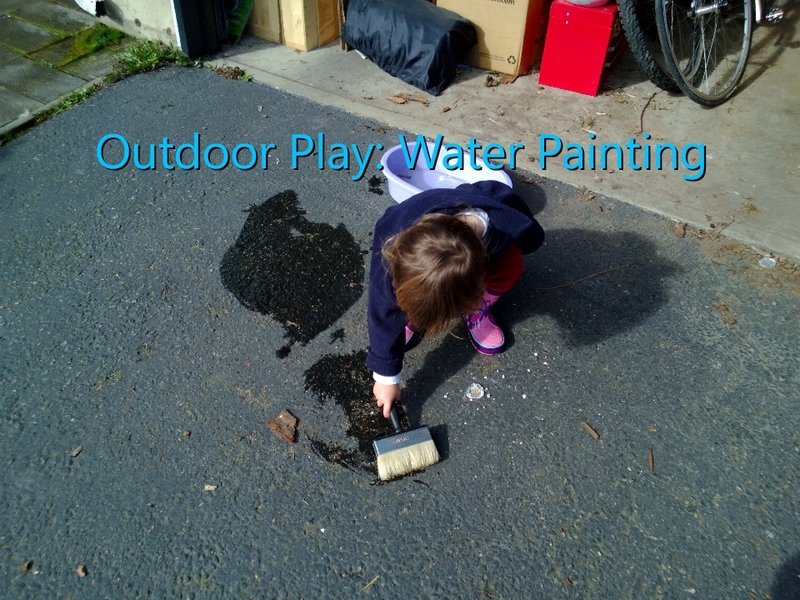 Painting on a dry driveway was a very different experience. I later found a paint roller – below are her remarks as she played. Well, I come from an early education background….. but now I am home with the children……I write a blog about early education and parenting and I’m trying to work out what to do next. What have I been doing for the past year since I started my blog? Writing. What do I do during the evenings and when the children aren’t around? I write a blog. When I am not writing my blog what do I do? I write articles for websites, write children’s stories, write poetry and write diaries. What do you do when you are not writing? I research things to write about, read and take photographs of things of interest (oh yes and look after 3 kids). So I don’t get paid for any of these things but it is what I do. 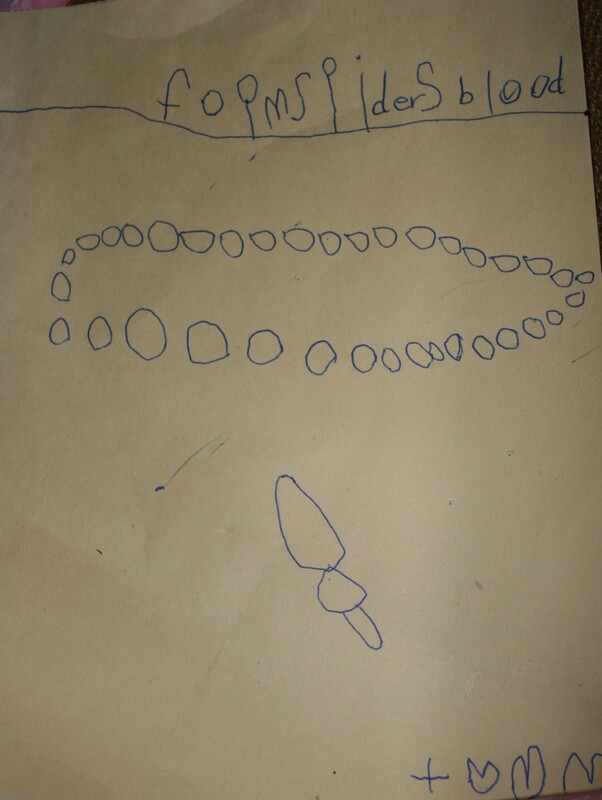 I have been writing since I was 6 years old. I would absorb myself so much in story writing that the words couldn’t hit the page quickly enough and would move in a diagonal fashion away from the margin. I was always being told that I needed to improve my handwriting. As a teenager I wrote poetry and short stories and enjoyed writing essays. My English teacher called me her shining star. 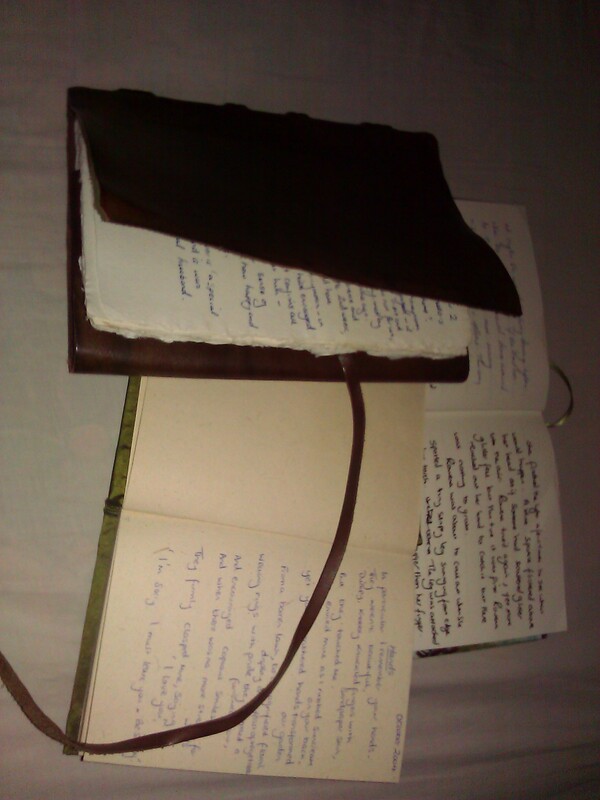 I always kept a diary and often wrote letters. I studied English Literature at University (I preferred English Language but there was no degree option for this) because I loved to read and write. On my honeymoon I wrote a journal of our trip and have kept a diary of pregnancies and the early years of my children’s lives. I had mostly A grades for my essays during my Masters Degree. A few years ago I read a book by Ken Robinson called The Element. The book talks about how finding your passion changes everything. Everyone has their ‘element’, some have more than 1 and some people never realise it. I wondered at the time what my ‘element’ was and now I know, it is and always has been writing. People tell me they like what I write, people tell me they like the way that I write, people even sometimes tell me that they are inspired by what I write. I may never get paid for my writing but that won’t stop me. If I keep writing and sending things to publishers and publications maybe one day I will become a professional writer. Even if I never make a penny as long as I keep writing and people keep reading .